Get a dynamic dns name. On older an older Linksys it would be under Advanced tab then the go Forwarding tab. You will see a similar page. In the application box put watch VNC. Put 5500 in both the Start and End box. Choose Both for the protocol. 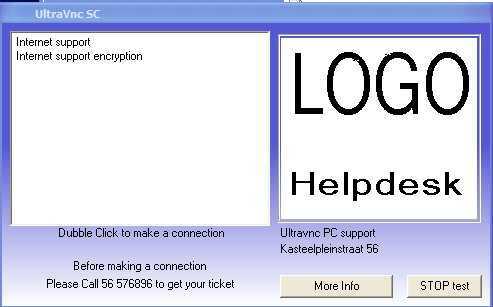 For the IP address enter the IP of the computer that you will be using for the remote support. When you get to the Shields Up page, enter 5500 in the box and click “User Specified Custom Port Probe. You will also see some other options such as follow link Scan Common Ports and All Service Ports feel free to experiment. If you see ports listed as how to exercise for weight loss OPEN this means some service / application responded to the port probe request! You will see how this work later. UltraVNC SC allows you to create a custom executable that the end user will run that allows you to remotely control their computer. Don’t worry tin-hat people you need to confirm the remote control of the computer so it can’t be used maliciously. Extract the files to a directory on your computer. Edit the helpdesk.txt in the directory that you extracted. You can modify the other parameters if you want. They control some text and behavior in the application. See the site for details. Save the helpdesk.txt and zip up all the files in that directory to a single file like remote.zip. All the files must be named exactly as they are when first downloaded. NOTE: The name of the zip file will be the name of the executable that the user will click on when we are done. Go to http://www.uvnc.com/pchelpware/creator/index.html to use the online creator tool on the UlraVNC website. When the user runs the executable they will see the below interface and they will need to click “Internet support” in the box on the left side of the application. From UltraVNC Menu -> Run UltraVNC Viewer (Listen Mode).Note: Make sure VNC is in listen mode before the user initiates the connection. When the user initiates the connection you will see a message asking if you want to accept the connection. Once you click Yes you will be connected to the user’s computer and remotely control it. I couldn’t understand some parts of this article How To Setup Single Click Remote Control Support, but I guess I just need to check some more resources regarding this, because it sounds interesting. This is the best, most-comprehensive “how to” I’ve found on this subject. We have been using GoToAssist and NTR Support, both are OK but certainly not worth paying for. I’m interested in using SimpleClick but need something reliable and easy for the customer to use. What are others opinions of this software in a IT Support environment?